Elton is the brother of Eloutzica and he is broken both to ride and to drive. His first competition was driving, intermediate level. 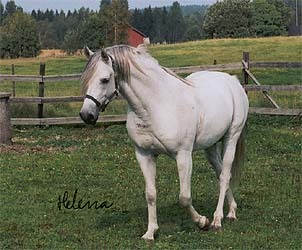 As well as being a good "doing" horse, he is a good breeding stallion too. His father was imported from Poland at the same time as Karnawal. Etnograf was one of the last sons of Etna. Elton belongs to the dam line of Sahara OA imp 1845 to Jarczowce. The strain is Kuhailan and the only direct line from Sahara OA is that from her daughter Sahara Slepka OA who was foaled in transit. Many members of this family perished in World War I and only two mares were saved, Pomponia 1902 and her daughter by Kohejlan OA, Zulejma 1914. After the war Pomponia had two more daughters, Dora 1922 by Bakszysz and Bona 1920 by Mazepa I. Of the postwar daughters, only Dora had any impact on the breed. Zulejma 1914 founded three branches of this family through her daughters Dziwa 1922, Ferja 1924 and Huryska 1926. Dziwa would have been covered in glory if she only had produced Ofir but beside him she produced two other stallions, Taki Pan and Jezupol, and the mares Mokka, Limba and *Niwka. Mokka's daughter Mokdiara produced *Diara Mokka by Wielki Szlem who was imported to Sweden with her daughter by Negatiw, *Diaspora. The only remaining line from *Diara Mokka is that from her daughter Ex Diara. 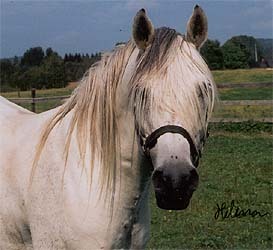 *Diara Mokka also produced the stallion Diamant by *Exelsjor, full brother to Ex Diara. Ex Diara was one of Salex foundation mares and dam of many good horses, among them the stallions Exodus and Expert. Her daughter Ellenora is the grandam of Elton. Another source of Mokdiara blood has been imported to Sweden through Melisa by *Namiet and her daughter Mepala by Palas, imp in utero. Mokdiara was the granddam of *Moneta who produced Melisa.